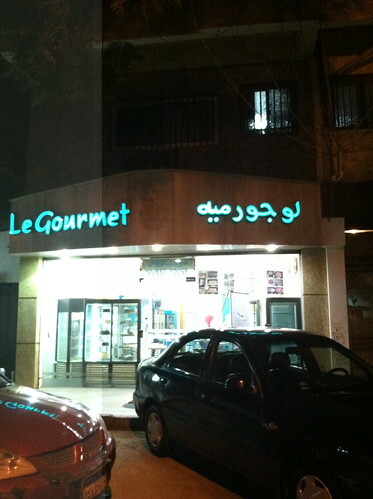 This is a bakery on a side street in Mohandessin, called "Le Gourmet" in Latin letters on one side, and لو جورميه on the other. The Arabic here is great, because it's clearly working directly from the French, rather than via another language. Here we have the ج represents /g/ phenominon, the idea that the word ends in an /h/, and, most interesting to me, writing the vowel of the word "le" using the و, which we usually write as a u in English. I'd write the underlying French vowel as a /ʌ/, I think--and given that Arabic only has three long vowels (and long vowels are preferred for transliteration from other languages, to reduce ambiguity), u is probably a better choice than a or i. Still, though, not where I would have gone, with a more orthographic and less sound-based transliteration plan. I have something of a linguistic puzzle that I can't follow. I'm hoping that both the folks around these parts better at Arabic, especially Cairene Arabic, than I am, and those who have formal training in linguistics, will be able to help me out with puzzling through this question of orthography. So, Arabic has this letter, jiim: ج. Nice little letter, fifth of the alphabet, reasonably easy to write. In most dialects, it is pronounced like j in jar (IPA /dʒ/); so mountain is jabal, beautiful is jamil, etc. However, in most variants of Egyptian Arabic, it is pronounced like g in grip (IPA /g/); so mountain is gabal, beautiful is gamil. Generally, Egyptian Arabic doesn't have /dʒ/, and other dialects either lack the /g/ or get to it via some other sound change, frequently /q/=>/g/. In many ways, /dʒ/=>/g/ is the 'defining' sound change for marking the Egyptian accent (maybe like the vowel change in 'about' for marking Canadian English? sociolinguists, help me out). For me, at least, this was an easy sound change to remember in the switch from formal/Levantine Arabic to Egyptian; I had a lot more trouble remembering to tell the cab driver I was going 'urayyib min fundu' Flamenco, not qariib min funduq Flamenco, than that I should tell someone their baby was gamil, mashallah. Both are intended to say "private garage," meaning that you can't park there; parking is at a premium in Mohandessin, most streets are double parked, and young men make livings rearranging parking on the streets to be more efficient. The issue is how they wrote the word 'garage.' The Arabic word is generally pronounced like the English version (though I think it actually comes into Arabic from French). Therefore, in most Arabic dialects, the Arabic alphabet would contain a way of writing the last sound, /dʒ/, but not necessarily the last; in Egyptian Arabic, the alphabet has a way of writing the first sound, /g/, but not the last. Arabic has a way to handle this: it borrows the letter چ back from Persian and its related languages, where it represents the sound /t͡ʃ/. Those three dots underneath indicate that it represents a sound not found in Arabic. This is a regular pattern in Arabic: Havana Hotel, where I was staying, wrote its Arabic name with a ڤ, which is an /f/ with extra dots, for instance, and I've seen پ (/b/ with extra dots) used to make the sound /p/. But you'll notice that these two signs don't spell the word the same way. The first spells it as چراچ, which I'd write as [dʒajadʒ], or "jah-raj." The second writes it as جراچ, which I would write as [garadʒ], or "ga-raj." I don't have a photo, but I know that I saw it written as جراج at least once, that is, as [garag]. 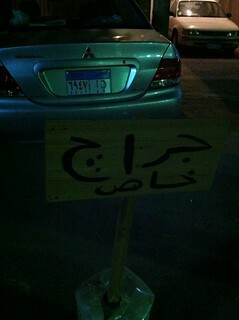 On the one hand, I really get the signs that use ج for both sounds. That letter is there, it's understood, people will get it. I don't add diacritics or accent marks to my English most of the time if I'm writing a word of foreign origin: I write role, not rôle, for instance, even though it's a direct loan from French. (OK, I probably add more accent marks than most people, but I think we can assume I'm not a typical Anglophone.) I also get the ones that get the spelling "correct," by my understanding of what the sounds in question are. What I don't understand, at all, is what's happening when the چ is used in both positions. It includes both the 'foreign' sign AND doesn't accurately represent the phonetics of the thing. How did the sign-writer get there? 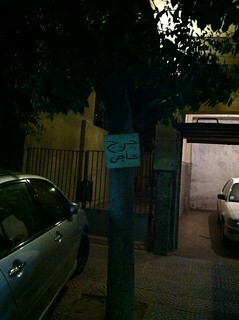 Possibility 1: I've drastically misunderstood how the word 'garage' is said in Cairene Arabic. Fair enough, except that doesn't necessarily explain the inconsistency in how it's written. Possibility 2: This is a repetition issue. Whoever wrote the sign had a thought process like, "I have to write that one weird letter. Maybe they should both be that weird letter." Possibility 3: This is an overcorrection. "Wait, one of these ج has to have three dots. Which one? Can't remember. I'll just do both." Possibility 4: The چis a mark of foreignness. Garage is a foreign loanword; چis a borrowed letter; they go together, somehow. What do you think, friendly readers? How can we spell "garage"? This morning, I got a call from my mother, which is not so unusual. But what was unusual was that she wanted my help for one of her students (she works for a student support program at a community college). Her student was taking Arabic, and had to ask someone a list of questions. Could I do the interview? If you're among them, that's great! I think everyone should learn Arabic, despite my tetchyness above. I would generally recommend you take a structured course to learn it well, whether at a university or community center or mosque. Arabic is a difficult language, with a lot of sounds not present in English (and one or two missing from most European languages). It's also got a writing system that'll be new to most non-Muslim learners, and the root system is complicated. AND AWESOME. Have I mentioned Arabic is the most awesome language ever? Because it totally is. But, if you don't have access to a class, you can teach yourself some Arabic. Even if all you pick up are greetings and a notion of how it sounds, it's an awesome language to know. ETA: I totally forgot about BBC Arabic's streaming audio option. Ooh, and they've added TV since I was a regular user! The internet is so shiny.